Corey Waite Arnold is the Communication and Publications team’s graduate assistant for this academic year. This is not the first time Corey performed library work, though. As an undergraduate at Transylvania University, Lexington, Ky., he worked as a library archive assistant in the J. Douglas Gay Jr. Library. Corey earned his bachelor’s degree in English in 2009 and is currently enrolled in the Villanova University English Department’s graduate program. 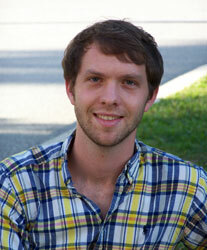 Corey will help with reporting and editing library cultural events, professional meetings and academic proposals. He is also preparing topic guides that utilize his research expertise. Before coming to the University, Corey taught English in an elementary school and junior high school in Kinomoto, Japan, from August 2009 until August 2011. Corey has also served as a staff member in an after-school program at Americana Community Center in Louisville, Ky. The center serves mainly African refugee and immigrant families. A native of Louisville, he now resides in the University City/West Philadelphia area. “I’m looking forward to what this new phase in my life will bring,” Corey says.